Pulling on fork tube, seal will not come out, how hard to yank? I am replacing the fork tube oil seal and I can't remove the seal by yanking on the slider. I have already removed the plastic horn and the associated dust excluding seal and the circlip. The fork is already out of the bike, oil drained out and from the length of travel of the shiny slider it is plausible that the inner parts are hitting the fork tube oil seal. I would expect by now that the old fork tube oil seal should start sliding out due the hammering of the washer and spacer. I have escalated to many medium strong manual pulls, with my adult son holding the black lower slider. What to do next? The thread for the top of the fork, the shiny tube is 34mm x 1.0 pitch and I wonder, has anybody made a tool to screw in to the shiny slider to help yank out the oil seal? Re: Pulling on fork tube, seal will not come out, how hard to yank? did you remove the bottom retaining bolt? Bottom retaining bolt? I see a 10 mm hex going straignt up the centerline of the fork tube. I started to loosen it and stopped. Should I remove it? I always install the spring, and cap, and compress the fork tube to apply pressure on the 'guts', then I hit that bottom bolt using an air impact wrench, to break it free and spin it out, with the fork compressed, then I remove the cap and spring again. the 'tool' is basically a hex on a shaft, and can be made from 4 hex nuts, and a piece of all thread... the nuts and all thread should be 5/8" thread, which has a hexnut the proper size to fit the internal locking nut's hex... so pick up a piece of 5/8" allthread, about 18" long, spin a nut on, then a flat washer, and then another nut, and lock them together tightly on each end of the rod.... this makes the tool, you will need it to re-install the bottom bolt after disassembling anyways, so make it before trying to removee the bottom bolt, as if it spins, you will need it for disassembly. Thank you Man of Blues. Got it. The measurements refer to a 2000 Connie fork. I made an internal hex adapter from a 1/2" x 6" hex bolt and some hex nuts. The hex driver size needs to be .857" (21.8mm) across the flats. The fork also has larger hex shape that measures about 1.023" (25.98mm). The bottom bolt in my 2000 Connie fork needs a 10mm hex wrench. Once I slid an internal hex adapter into place, the whole fork assembly was apart in two minutes. The hard to understand part of the fork is how do all the sliding parts work. 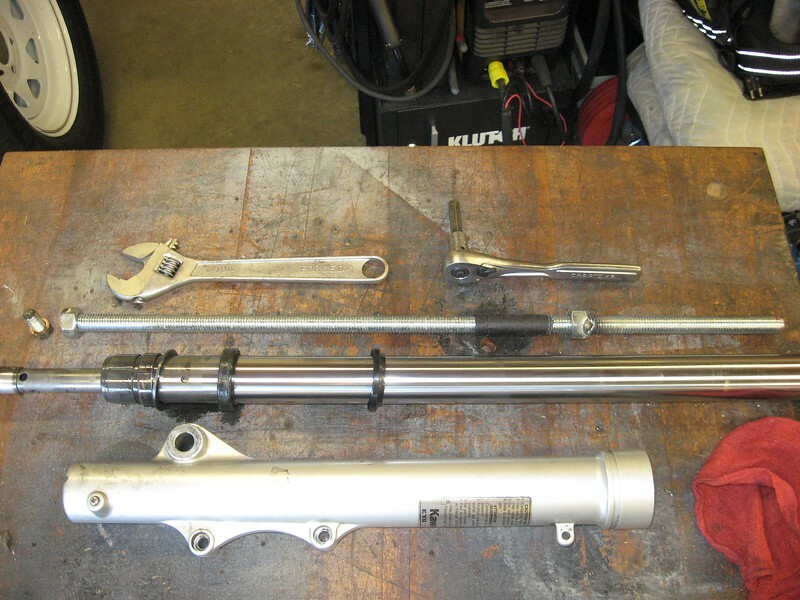 I attach photos showing the fork parts and tools laid out in order. If you "really" want to know how they work, read thru this. I just did the front forks of mine. I used the same method/tools as MOB. NOTE: To any using the air impact. DO NOT think you can get by with a 3/8" or other as you could easily round the bolt/hex hole.. Anyway, glad it worked out for you. Connie_rider's link to some technical pages on how forks work is the best drawing and explanation of how a motorcycle fork works I have ever seen. I tried making a freehand sketch of a motorcycle fork. I couldn't understand my own sketches. "If you "really" want to know how they work, read thru this. Thanks again Man of Blues for the detail on the correct size for the fork piston tool. My tool wasn't strong enough to torque the assembly, so I went to the hardware store. I took the Kawasaki fork piston to the hardware store and I started looking for a hexagonal object that engages with the recesses of the fork piston. I settled on a metric hex coupling nut. The hex coupler trade size is 16 mm x 1.0 and it cost $5. The hex flats are 23.98 mm (correcting error in original post) and the 48 mm long body drops into a 15/16" 12 point socket. A breaker bar and an extension bar makes a tool long enough to reach into the fork slider and engage with the recesses of the fork piston. Another socket wrench with a 10 mm hex bit turns the 10 mm hex bolt that goes up from the axle through the center line of the fork tubes. The Clymer's manual said torque the piston bolt and use loctite. I used loctite and tightened the 10mm hex bolt to a two arm pull on a 3/8" square drive ratchet wrench. The first fork took 1 and a half days. The second fork took 3 hours. I now have two forks super clean, new seals and filled with oil. I took the Kawasaki fork piston to the hardware store and I started looking for a hexagonal object that engages with the recesses of the fork piston. I settled on a metric hex coupling nut. The hex coupler trade size is 16 mm x 1.0 and it cost $5. The hex flats are 22 mm and the 48 mm long body drops into a 15/16" 12 point socket. A breaker bar and an extension bar makes a tool long enough to reach into the fork slider and engage with the recesses of the fork piston. Another socket wrench with a 10 mm hex bit turns the 10 mm hex bolt that goes up from the axle through the center line of the fork tubes. and an coupling nut for a 16mm thread, is 24mm wrench size.. These extra long hex nuts are used to connect all threaded studs or rods. I have my tool I made on your insight in my tool box (at the house, I'm at work). I'll dig it out and scope it out tonight. It's also possible to take a nut off a jack and put some blue tape on it, stick it in a socket and use that. The coupler I used is 23.98 mm across the flats. I was using memory, walking from garage to house. I have something other stuff on the workbench that may have measured 22 mm. My error. The coupler you looked up above is probably what I bought. I threw away the bag I brought it home in and I don't have any 16mm diameter bolts to test the inner threads with. I got the bike reassembled and so far with 20 wt fork oil I can't say it handles any better. So now, the question I am kicking around is what is a easy safe way to understand when a Connie front suspension is adjusted right? 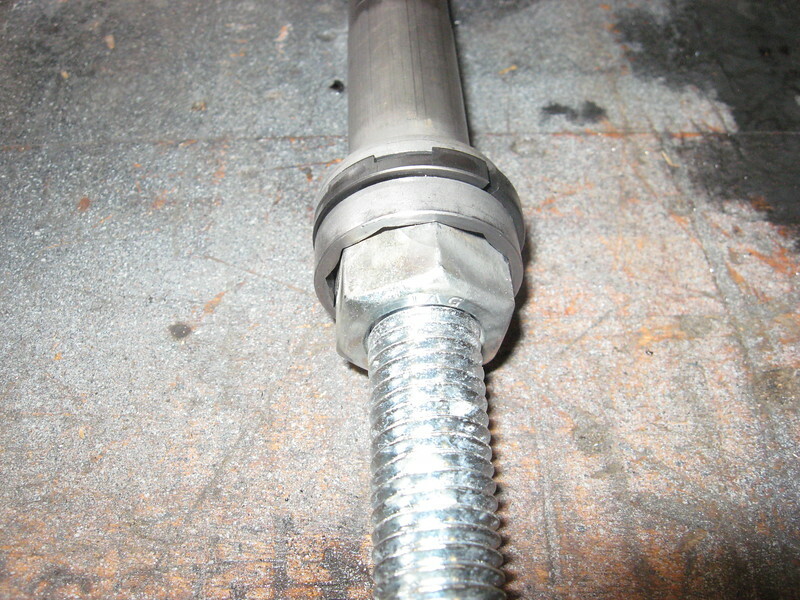 Threaded rod is 5/8", the nut takes a 15/16th socket. Picture posted at the other site because of restrictions here. Found a bolt at the local big box stores, 5/8's X 10" long that also worked. You can use a wooden broom handle with the end shaped like a truncated pyramid. Just jam it in there and it provides enough grip to loosen the allen bolt. Personally I locked 2 slightly oversized nuts together on a bolt and then ground in a slight taper.on the lead nut. I used the broom handle method successfully for a lot of years on a lot of forks, but a couple of years ago that method just wouldn't keep the inner damper rod from rotating on my KLR forks. That's when I did the deed and made the holding tool. Since I had the welder, I saved a few pennies on extra nuts and just welded the nuts in place. Worked great on my C10 as well. Did wrap some friction tape around the rod to protect the tube's inner threads. I still have that broom handle tucked away in the corner - JIC. Page created in 0.794 seconds with 25 queries.